Who's who in the film? Miracle in a Box is an inspiring film about the coming together of three events: the bequest of a grand piano, the student competition to win it, and the months and months of work required to make it sing again. The First Berkeley Piano Competition provides most of the music in the film with six talented finalists playing several classical selections. But jazz and blues blossom as well while Callahan Piano artisans take apart and rebuild the instrument before our eyes, hewing to standards as precise as a tenth of a gram. The close relationships and easy humor of the workshop accompany the highly professional techniques and tools. The winner of the competition, Jared Redmond, finally makes his debut on what is now his Steinway grand at the party given in the workshop as a finale. The celebration is not only about talent, but also about the dedication of craftspeople who give good performers a means to play better than they had imagined to be possible. Appearing on screen are Garrick Ohlsson, touring concert pianist; Jake Heggie, opera composer; Tammy Hall, jazz artist; Frederick Hodges, music stylist; Jerry Kuderna, Bay Area modernist; and Steve Willis, blues and boogie songwriter and performer. The narration is spoken by the distinguished actor, John Lithgow, and the film-maker is Oscar-winning documentarian, John Korty. Beyond the world of music, the documentary also provides a good look at some alternative ways to improve the American workplace, the quality of its products and the rewards for its employees. Come see a performance by the gifted pianist, Chloe Ma, who also appears in the film. "The piano film is marvelous! I'm so proud to be a part of it." "...it is a winner on all counts, and it does what very few films do – it makes you want to jump into the screen and be a part of it!" "Fantastic film. We have recommended it to everyone we know." 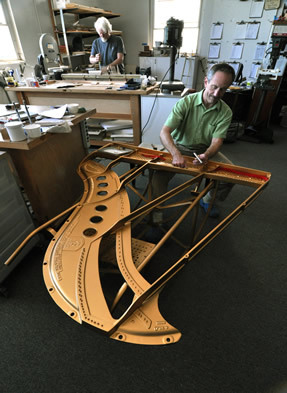 "I was so incredibly impressed by the work you do on pianos! I can't even tell you how touched I was by the whole experience." "I teared up - my father was a composer and piano player; as a toddler I played under his Steinway while he worked. "You captured the artistry of the restoration. You captured the uniqueness of Northern California: it is full of gentle, smart artisans who have multiple interests and talents. You also captured the uniqueness of the piano." At benefit screenings of Miracle In A Box, audiences have enjoyed Q & A sessions with the filmmaker, the piano technicians, and/or musicians from the film. Would you like to screen Miracle In A Box at your fundraising event? Bridge Pin Productions would like to collaborate with you. We will provide you with a screening copy of the film, discounted DVDs for resale and, when possible, one or more members of the film cast and crew. A screening of Miracle in a Box will be an interesting, entertaining and sucessful fundraising event and can easily be combined with a recital, silent auction, dinner, or VIP reception. Contact us to arrange a benefit screening for your organization.